Are you psyched and primed to enjoy glorious summer days? Unfortunately, ticks are pumped up, too. In fact, they party hearty after finding a suitable host. However, the fun is all one-sided since ticks can transmit viruses, bacteria, and parasites. This is why I want to tell you about rose geranium oil and its effectiveness against ticks. Your protection from infection is important to me and I want to equip you to avoid the threat of tick-borne disease. Ticks are eight-legged, blood-sucking insects that feed on animals and humans. They reside in leaf piles, grass, shrubs, and trees. They’re harder to spot during summer than fall, enlarging as the seasons progress. Insects the size of apple seeds in autumn can be very tiny in June, as small as poppy seeds. Also, a tick bite can go unnoticed since the insect’s saliva contains a numbing substance. Isn’t that clever? Personally, I get ticked off by insecticides purported to be safe. DEET is linked to neurological damage and can cause seizures, confusion, and slurred speech. According to Duke University Medical Center, studies show that DEET renders the death of brain cells as well as behavioral changes. The pesticide can cause memory loss, poor concentration, and hampered learning. Military reports during the Persian Gulf War confirm these findings. Exposure to DEET can also trigger headaches, breathing difficulty, fatigue, and tremors. It can weaken your muscles and impair coordination, causing staggered walking. The symptoms may not surface until months or years after use! The most hazardous repellents are those that combine DEET with other pesticides, such as permethrin. Toxipedia reports that permethrin destroys nerve membranes. The Environmental Protection Agency classifies the pesticide as a Type II toxin. Mice studies show it to be potentially carcinogenic. According to the National Institutes of Health, permethrin can alter blood oxygen levels, producing brain fog and seizures. When inhaled, it provokes coughing and breathing difficulty (source). Products containing permethrin are legally required to have “Warning” or “Caution” printed on their labels. Such words are clues to health hazards. There are several precautions you can take to avoid getting bitten. Here are steps to follow if you plan on gardening, camping, mowing the lawn, picnicking or hiking! Targeting areas favored by ticks. In particular, dab it behind your neck, ears, knees, and around your navel. Also, spray it on your clothes. Recipes using the oil follow in the next section. Don light-colored clothing to make hitchhikers more visible. Wear long sleeves and long pants. Tuck your blouse into trousers and pant legs into your socks. You may look a little nerdy, but your health is paramount, right? Also, safeguard your scalp with a hat and your feet with closed shoes. When hiking, stay in the center of paths and avoid brushing against branches. Thankfully, ticks are unable to jump. However, they do cling to leaves with their rear legs, poised to hijack a host with front legs. By avoiding proximity to where ticks perch, you’ll decrease the risk of making contact. Upon returning home or to a campsite, do a body check. Use a full-length or hand-held mirror so you don’t miss any areas. If you spot a tick, remove it with fine-tipped tweezers. Grasp as close to your skin surface as possible, and slowly pull straight up. Don’t coat the insect with nail polish, petroleum jelly, alcohol, or gasoline. It also won’t help to stab the bug with a needle, nail, or hot match. 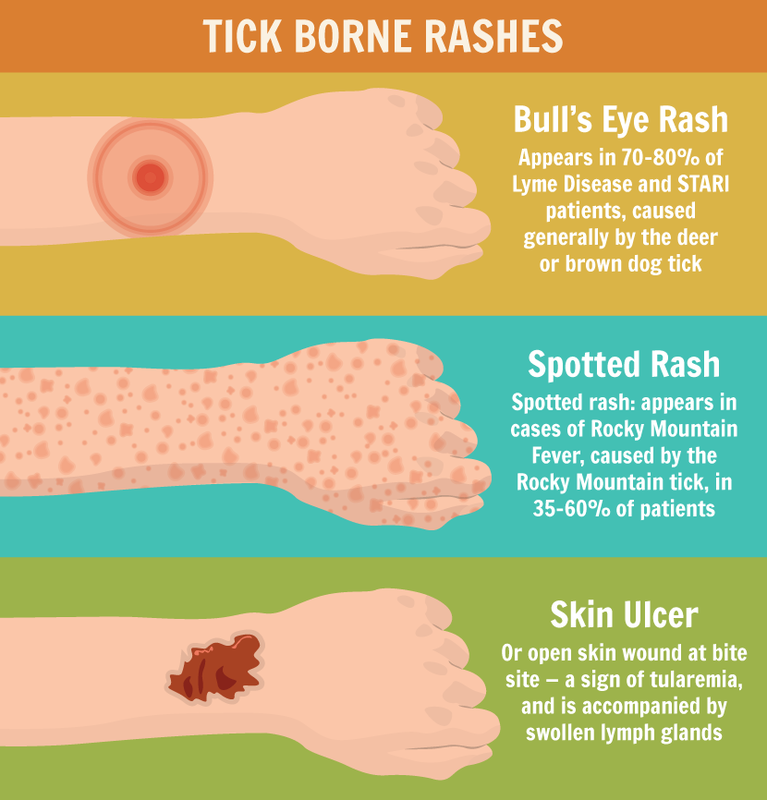 These actions may cause the tick to cling tighter or regurgitate into your skin. Thoroughly clean the bite with soap and water, rubbing alcohol, or an iodine preparation. Place the tick in a jar containing alcohol, write down the date of removal, and affix the note to the jar. If you observe any signs of infection, see your doctor promptly. Run your clothes through a dryer on high heat for 10 minutes or until wet clothes are completely dry. This action kills any lingering ticks. Since the insects can survive machine washing, it’s best to expose them to the high heat of a dryer first. Then wash your clothes in hot water. Although this method sounds backward, it’s the best means of elimination. The force of the water spray will help remove ticks before they can bite! Rose geranium oil prevents ticks from detecting your presence. A tick’s front legs possess organs that perceive odor, carbon dioxide, temperature, and movement. These structures tell a tick you’re approaching. However, rose geranium oil masks your human scent! It can also be used to repel fleas. A 2013 study in the Journal of Agriculture and Food Chemistry found that rose geranium oil repels ticks with 90 percent effectiveness (source). The oil is extracted from the leaves and stalks of the Pelargonium plant, acquired through steam distillation. The fragrance is both fruity and earthy. Although the scent of rose, lemon, and apple is delightful for humans, ticks detest the aroma. Note that there are two main species of rose geranium oil. You should use the essential oil with the botanical name “Pelargonium capitatum x radens”. It’s the most effective at repelling ticks. You can find it here. What’s the difference between geranium and rose geranium essential oil? Geranium oil and rose geranium oil have a lot of qualities in common. The names are often used interchangeably between these two species. Rose geranium oil is very similar to geranium essential oil except for the scent, which is rosier! Mix thoroughly and siphon the mixture with an eye dropper. Apply three drops per localized area and massage into your skin. Using almond oil as a carrier enhances the solution’s effectiveness since ticks hate the sulfur in the oil (source). Spritz on your clothing and skin (source). To protect a canine from ticks, mix 3 tablespoons of almond oil with 20 drops of rose geranium oil. Apply three drops to sections of the dog’s fur, especially the collar area (source). NOTE – If you want to use rose geranium oil on your cat, please consult your veterinarian. Some essential oils can kill cats if they are not used properly. Read more here. Using rose geranium oil as a tick repellent, you’ll deter the pests and enjoy health benefits. You’ll be one happy camper. By avoiding DEET and permethrin, you’ll sidestep neurological injury. If you own a dog, your faithful friend will be spared from seizures, vomiting, and weakness (source). Forgoing pesticides also protects our water sources, marine life, and birds from lethal chemicals. In addition, the sweet scent will make you pleasant company! 1 tablespoon of witch hazel or vodka. Caution: Essential oils should be used with extreme caution especially during pregnancy. Please consult a qualified aromatherapy practitioner before using essential oils and read this page about the use of essential oils. So, are you revved to try this natural tick repellent? Perhaps you have a positive testimony. Please share your thoughts and experiences below! « 5 Natural Alternatives to Caffeine: How to Increase Alertness Without Coffee!